My good friend Katelin from My Wardrobe Staples and I teamed up together to bring y'all this How We Wore It: Graphic Tees Edition. 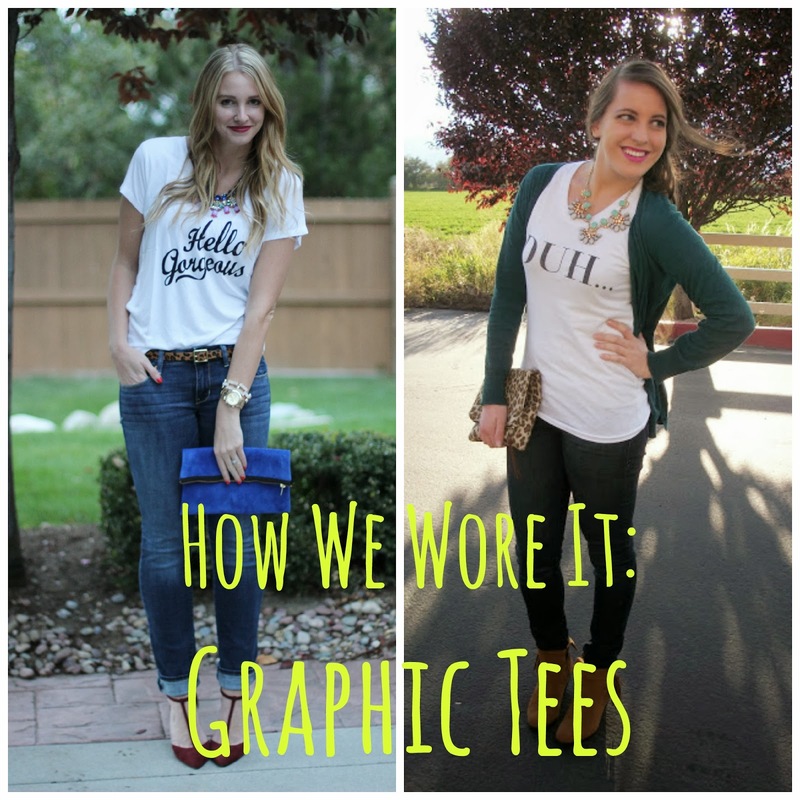 Y'all know how much I love to wear graphic tees and I'm so glad we get to feature how we wore our newest ones! Make sure to check out her blog to see her complete look! I'm seriously obsessed with her graphic tee and all her fun accessories, I'm dying over those heels! I want them so bad! Katelin and I are always getting advice from each other of what things we should buy, I wanted this duh... tee from Style Lately and I was kinda on the fence about it, but she convinced me to get it and I'm so glad she did!! I love it, its such a fun tee, and it can be worn so many ways. I paired it with one of my new favorite cardigans I got from Nordstrom Rack, I love the color. I love those jewel tones for fall! And this necklace from Sassy Steals has quickly become one of my favorites! Don't forget to enter for your chance to win a $125 Zara Gift Card Giveaway HERE!! And the winners of the Baffin Packables Rain Boots are Emily Bylund and Paige Jennings Phillips!!! Congrats girls! Please email me at lilyac13@gmail.com within the next couple days to claim your prize!! In love with that shirt. I need one! It's fun reading all the linked up posts over on Style Elixir and Love & Lace Thanks for linking up!! Umm the two cutest girls in one post!? I am loving it!! You gals both look adorable! I love how you added color to your tee with a cardigan, and a statement necklace is such a chic way to dress up a graphic tee! Love the look - graphic tee and the booties? Super cute! Thank you for linking up with What I'm Loving Fridays! Come back this week for something special! Love that shirt! Thanks for linking up for Favorite Fashion Friday. Hope to see you back tomorrow!